Rotary Bangalore IT Corridor (RBITC) successfully concluded the 12th edition of PhonePe Bengaluru Midnight Marathon on Sunday at KTPO, Whitefield. RBITC will be using the funds collected at the marathon for various initiatives focused around spreading awareness and programs to benefit the differently-abled. More than 11,000 running enthusiasts and professional marathoners from 19 countries took part in the world’s only Midnight Race. For the first time, 85 differently-abled champions, lead by Blade Runner Shalini Saraswathi participated in the event. 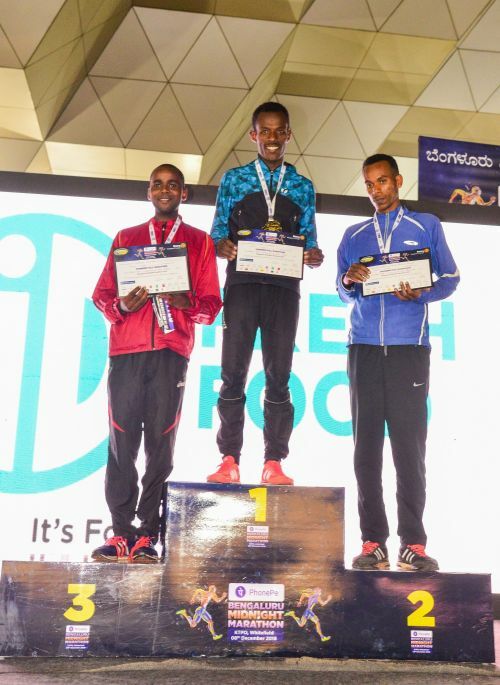 The Full Marathon was flagged off at 12:00 midnight and the winner in the Men's category was Tave Pabeker with a timing of 2 hours, 21 minutes and 52 sec while in the women’s category, it was Fekede Simegn with a timing of 3 hours, 11 minutes and 36 sec. The Bengaluru Midnight Marathon (BMM) is a member of the Association of International Marathons and Distance Races (AIMS-IAAF). Apart from being a serious stage for professional runners, the BMM is also a community-driven event which has six other races along with the full and half marathon. Key events on the night included Full Marathon, MOVEINSYNC Half Marathon, AKAMAI Open 10k Run, Prime Venture Partners #FittestStartupChallenge, Airbus Corporate Relay, MANIPAL PROLEARN 5K IT City Fun Run, Differently-abled walk and HPCL Community Relay. The Differently abled walk was flagged off by Theme Ambassador, Blade Runner Shalini Saraswathi. Wheelchair Cricket India (WCI) team, the brainchild of international para-athlete and national awardee Pradeep Raj, participated in the Differently-abled walk. The event also witnessed performances from two bands, Rhetoric and Mishram. Magic shows, Midnight Market, dholaks and food stalls kept the runners and the visitors energized through the night. Calicut Half Marathon 2019: "United Kerala- Upholding Legacy"